Produced by Element Pictures and Company Pictures, the team of writers behind ‘Red Rock’ includes an impressive mix of established and emerging talent. Coastal spots Dun Laoghaire and Howth will be home to the fictional seaside town of ‘Red Rock’ while the hard set will reside in Players Square, Dublin. Production of TV3’s new soap ‘Red Rock’ will get underway this week. ‘Red Rock’ sees TV3 embark on its most ambitious ever commission, working with two major production companies, Element Pictures and Company Pictures. The brand new soap will hit screens in January 2015 with a whole host of new characters for Ireland to get to know and love. Starting on the day that a long, dormant feud between two local families is brutally reignited, this continuing drama is based around a busy Dublin police station. On one side, the Hennessys, a local dynasty, whose name is above half the businesses in town. On the other side, the Kielys, former trawler-men, who have turned petty crime into a cottage industry. Charting the life and dramas of a community about to be enveloped by a feud, through the eyes of those who police it, each episode will be a mix of ‘crime of the week’ stories and on-going serial arcs, following principle characters in both their professional and personal lives. A powerful and moving drama, ‘Red Rock’ is set in the shadow of Ireland’s ‘gold rush’. John Yorke and Ed Guiney from Company Pictures and Element Pictures are Executive Producers with Company Pictures’ Cahal Bannon acting as Head of Production and Element Pictures’ Andrew Lowe also overseeing production. Highly experienced drama writer Peter McKenna is the showrunner on ‘Red Rock’. In 2010, Peter became the first Irish writer to be selected for the BBC Writers Academy. His writing credits also include ‘Doctors’, ‘EastEnders’, ‘Casualty’ and ‘Holby City’. His other Irish television credits include ‘On Home Ground’, ‘Littlebird’, ‘Fair City’, ‘Legend’ and ‘The Clinic’, where he was appointed Head Writer and Story Consultant, as well as new BBC One drama series ‘Frankie’ and ‘The Musketeers’. Hugh Farley (‘Fair City’, ‘Ros na Rún’, ‘Deception’) is series producer (production) of ‘Red Rock’ and Gareth Philips (‘Coronation Street’, ‘Hollyoaks’) is series producer (editorial) for ‘Red Rock’. Lauren MacKenzie is confirmed as the series’ present planning producer, with her television work including award-winning drama series ‘Bachelors Walk’ and ‘Pure Mule’ for RTÉ and TG4 series ‘Na Cloigne’, and Trevor Colgan (‘Fair City, ‘The BTW Diaries’) will be ‘Red Rock’’s future planning producer. The ‘Red Rock’ writing pool is made up established and emerging writers from both the UK and Ireland. The team has been working on scripts over the last few months and the hard set at Dublin’s John Player Factory is complete and ready for shooting. TV veterans from Ireland and the UK are Tim Loane, Anita Pandolfo, Eugene O’Brien and Marcus Fleming. Others who will be joining the team are award-winning playwrights Amy Conroy and Ursula Rani Sarma. The list also includes, Kim Revill and Ted Gannon. 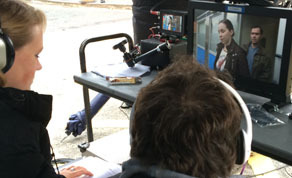 Other key crew members include director Matt Carter, DOP Ciaran Tanham, casting director Louise Kiely, costume designer Belle Phipps, and hair designer Joanne McNaughton. Make-Up Designer Robyn Wheeler and Make-Up Assistant Ruth O'Rourke, David O’ Mara is locations manager, Sean Keeley is editor and Niall O’Sullivan, Peter Slater and Sean O’ Toole are on sound. Some well-known names who have been cast in Red Rock include Richard Flood (‘Crossing Lines’, ‘Killing Kennedy’) who plays central character Garda Superintendent James McKay, Sean Mahon (‘Philomena’, ‘Mr & Mrs Smith’) who plays Garda Sergeant Brian McGonigle, and Cathy Belton (‘Philomena’, ‘Roy’, ‘The Tiger’s Tail’) who has been cast as Patricia Hennessy, the matriarch of the Hennessy family. Other well-known actors include Andrea Irvine (‘The Boxer’, ‘Evelyn’, ‘Ella Enchanted’), Liam Carney (‘Braveheart’, ‘Gangs of New York’, ‘Angela’s Ashes’) and Denise McCormack (‘Cuckoo’, ‘1000 Times Good Night’, ‘Love/Hate’). ‘Red Rock’ is a €7m investment in Ireland’s first new soap for over a decade. It will employ up to 130 people full-time and will air twice a week from January 2015.